Now let’s make something clear first. I love spy stories. Le Carre, Fleming, Deighton; all three are in my favourite authors and the cold war period of espionage certainly seems like an excellent setting for a Doctor Who story. The first story in this years, Seventh Doctor Trilogy (though in matter of fact the first of a pentalogy), Red Planets continues the pairing of the Doctor, Mel and Ace. 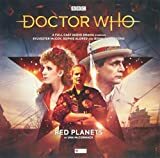 Taking it’s ques from Cold War spy thrillers in the vein of The Spy Who Came in from the Cold and The Quiller Memorandum, Red Planets is an evocative, thrill a minute story that packs its punches but keeps its secrets close to its chest until its final moments. Written by Una McCormack, this is an impressive high concept tale that weaves intriguing espionage, with time-bending mishaps-even if the impressive ideas aren’t always given enough room to breathe. If that sounds like there’s a lot going on you’d be damn right. Unfortunately, this means that some of the ideas whilst ingenuous, need just a little bit more room to breathe. The revelation of what is up on Mars in particular. This idea is one of Una’s most captivating but unfortunately, it’s reduced to an exposition-heavy explanation by the Doctor in a story that has one too many of them. The result was I often found myself having to pause and skip back a little just to make sure I was taking everything in. However, in terms of atmosphere and thrills, the story succeeds massively. The paranoia of a lot of the aforementioned Spy fiction is captured beautifully and Mokoshia really does feel like a threatening place, reminiscent of many of our darker Socialist dictatorships. The fact that the individual who will eventually cause all of this never makes an appearance is also a wonderful decision. This is a story about consequences and the characters who have to suffer because of his actions, not about him. Sylvester McCoy, Bonnie Langford and Sophie Aldred are all wonderful as usual. Sophie Aldred in particular always works incredibly well alone and the character of Ace works wonderfully well in the world of 1960’s Berlin. Bonnie Langford gets some great moments taking further swipes at the Doctors character and in particular his moral stance on the rewriting of history- no matter how many individuals from the parallel world will be lost. Likewise, Sylvester gives his own in these scenes, giving a sense of a Doctor who is tired of trying to explain, knowing she’ll never understand. The supporting cast are all great, though admittedly I didn’t feel like they were really given much to play with, the emphasis being more on the ideas than supporting characters. Red Planets is a great Doctor Who story with some great ideas. To really of been a classic it needed perhaps one more rewrite just to sort the pacing out. However, the result is none the less entertaining and comes recommended. Writer Justin Richards continues his warped timeline of World War I storyline (started in Men of War) in this Third Doctor original Audiobook read by Katy Manning, which follows up on the lead that the Archduke Franz Ferdinand survived his assassination and the war was delayed somehow. The Third Doctor regrets having done nothing about the discrepancy after he discovered it in his first incarnation, but as that story took place in the midst of the Daleks' Master Plan, I suppose he was busy at the time. In this installment the Third Doctor and Jo Grant end up in an earlier part of the war, and meet the nurse who had saved the Archduke from death, and figure out who was possessed and causing the time disruptions. Manning's reading is highly entertaining, and the story is just as interesting as Men of War had been, though with a slightly better ending this time around. I still feel like there is a loose thread, as the Archduke still seems to have survived...and now the Third Doctor isn't busy...so why not solve this? If he did solve it, it was so brushed over that it did a disservice to the story. We still have one more of these audiobooks to go in this series, so I suppose it will all be wrapped up then. 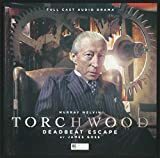 For a quick light adventure, these Audiobooks are decent fun, but they leave a little to be desired in the story department. But Katy Manning is always fun and she does a great job reading this story. In this new original audiobook featuring the First Doctor, we have a short adventure built into the middle of the classic First Doctor epic serial The Dalek's Master Plan with the Doctor, Steven, and Sara Kingdom ending up in the middle of World War I, and finding that the timeline has been delayed, and it is causing havoc on the Web of Time. As a simple short story, Men of War is solid on atmosphere but feels incomplete. It has a good premise, a major battle of the war has not yet begun, and now the timeline is trying to fix itself by swallowing up all the lives that would've been lost if the battle had taken place. The problems of this audio are in the ending, which feels like a lazy quick wrap up, leaving dangling threads for another story to solve. The big cliffhanging reveal is that Archduke Franz Ferdinand survived his assassination that launched the world into war, meaning the Timeline is even more screwed up than initially thought. But the Doctor just sort of says that it will have to wait because they must avoid the Daleks, and the story is over. It is unsatisfying to the story being told. It feels like this story has all this promise and then it just ends with a tease that basically tells the listener to buy another audio if it wants to get closure. This might not be a huge problem if the story felt like it had a more satisfying conclusion to it's contained story. I've enjoyed many a Doctor Who adventure in a variety of formats that ends with a tease of tales to come...but if you have a self contained story that teases more to the story, the ending for the self contained bit ought to be a bit more interesting. As I already have the next story (Horrors of War), it takes the annoyance out of that ending. And I've already seen that the title of BBC Audio's third release, also written by Justin Richards, is Fortunes of War, which has me more prepared for the story to end later. But if I were a listener who purchased an audiobook and didn't know it was part of some bigger plot-line, I'd be a bit more irritated. But let me dial back the criticism a bit. I actually liked the bulk of this story. I thought Peter Purves did a lovely job reading it, and it has some brilliant ideas floating around. I am quite interested to hear this little series of audiobooks out. It doesn't have a great ending, and while the cliffhanger feels like a cheap way to not actually end this specific story...it is a good cliffhanger that left my interest peaked. Doctor Who - Short Trips 8.08 - Flight Into Hull! "Oh great, TWO Jackie Tylers....isn't that just wizard!" So - first The Siege of Big Ban, and now Flight into Hull! Big Finish are positively spoiling us with tales of the meta-crisis Doctor and Jackie Tyler. After the events in Big Ben, and in an effort to have Jackie and the Doctor get on more, Pete and Rose arrange a private zeppelin flight for the pair, to the 'famous' spa city of Hull, to see it's great glass pyramid, and sparkling blue waters (obviously this parallel world has some very big differences to ours!). However things don't go as planned (do they ever? ), thanks to a new Jackie Tyler, crashing into this dimension, and our party. The difference in this new Jackie though is that she is sharp, intelligent, cunning...and desperate to save her own children from her dying world, which is suffering from severe global cooling. As with The Siege of Big Ben, Joseph Lidster delivers a smart and very witty, story for the Short Trips range. This is a perfect ship in a bottle story, which at first is quite light hearted and breezy, but quickly takes quite a dark turn, not only through the desperation of this new, second Jackie, but also exploring this Doctor's humanity, and the realisation that if he dies - he won't regenerate. Camille Coduri again excels at not just our Jackie, but this new Jackie as well, and obviously has fun playing the new characterisation of what must be by now a very familiar role. You can buy Flight Into Hull here.